Trainer Adrian Bott declared Invincible Star on track for The TAB Everest after her luckless defeat at the hands of Ball Of Muscle on Saturday. But he concedes stablemate English has some work to do to regain momentum for the $13 million feature next month. 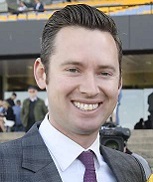 Trainer Adrian Bott. (Pic: Bradley Photos). And jockey Hugh Bowman was rapt with his first sit on his Everest mount Brave Smash. Invincible Star was expected to lead the Group 2 $200,000 Bowersmans Office Furniture Shorts (1100m) but she jumped slowly and jockey James McDonald had to settle her off the pace and that left Ball Of Muscle with an uncontested lead. “It was a huge run, we were hoping she would have been able to be closer in the running and utilise her early speed,’’ Bott said. “For whatever reason she was a stride slow but the good thing is it showed a different dimension to her. She relaxed nicely and she showed a turn of foot. Invincible Star, who runs in the GPI Racing slot in The Everest, firmed from $26 into $17 while Trapeze Artist ($5) regained favouritism for the TAB Everest with Redzel ($6) missing The Shorts through a minor injury. As for English, who stayed at $26, Bott and jockey Tim Clark said the mare had some excuses through pre-race issues, she cast a plate, and a lack of pace. “(Losing a shoe) didn’t help in the lead up for her,’’ Bott said. Brave Smash, last year’s third placegetter, is running in the Chris Waller Racing slot in The Everest and Bowman can see the gelding continuing to improve. The Darren Weir trained sprinter was held up slightly inside English early in the straight and Bowman said he let down strongly and gave him the impression he’s looking for more ground. “He’ll be more suited at six furlongs,’’ Bowman said. While plenty of post race talk was about The Everest runners take nothing away from Ball Of Muscle who had run second to Rebel Dane, Takedown and Redzel in the past three runnings of The Shorts. Trainer Joe Pride said Ball Of Muscle wouldn’t be out of place in an Everest himself but is more than happy to take the win and see what happens later. “It’s funny to see an eight-year-old in what looks to be career best form but it would be hard to argue that,’’ he said. “I’m really proud of the performance and he will improve a bit more for his next couple of starts. “He’s racing in career best form and he will give a great sight. Some of these other horses may or may not have performed at Randwick but this horse is extremely consistent.